The wedding for Menno and Emma is now history. We wish them a long and happy married life together, with God guiding their way. Once again we do all that work for just one day, but it’s a special day they will always remember. When two become one in a marriage until death do them part, it takes effort from both to make it a happy marriage. My prayer is for every couple to have a blessed marriage. The cold weather made it harder to prepare for this wedding than for most, but we actually stayed pretty warm all day. The building in which the tables were set up seemed warm. The wedding wagon [a rented unit in which the food is prepared] was throwing a lot of heat, and with the big tall propane heaters the building warmed up. Wedding services were held on Friday at their neighbors’, in a big heated building. Their neighbor lady Laura and I were head cooks, so our job was to make sure we had all the ingredients there to feed 1,000 people or more for the day. 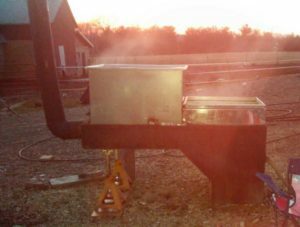 Six hundred pounds of chicken were grilled by Menno’s uncle. They started at 3:30 a.m. Four hundred pounds of potatoes were bought. 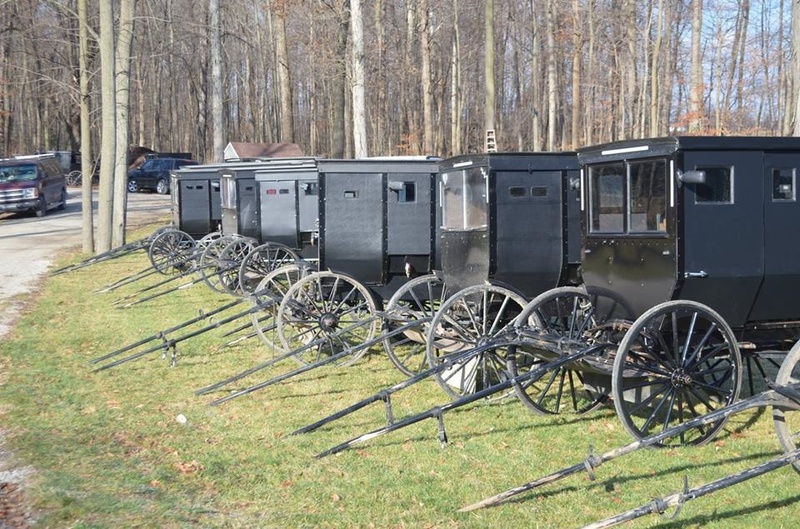 The wedding wagon came with plate settings for 360, but there was only room for 260 plate settings. We needed to save room in the building for heaters and a place to fill the serving bowls of food, which we would have done outside in warm weather. 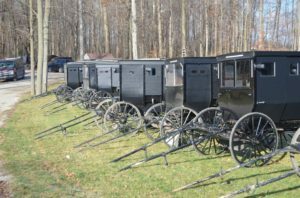 Many neighbors, church members and family brought their buggies to help with food preparation before the wedding of Lovina’s niece. Photo courtesy of Ruth Boss. Laura and I were there Saturday, Tuesday, Wednesday and Thursday before the Friday wedding. Cooks came on Wednesday and Thursday to help prepare food and do jobs that could be done before the actual wedding day. Sixty-four pies were baked, the chicken cut up and washed, 30 loaves of bread toasted for dressing, pudding prepared for peanut butter pie and dirt pudding, vegetables diced and shredded, plus so many more jobs completed. The menu consisted of chicken, mashed potatoes, gravy, dressing, noodles, mixed vegetables, lettuce salad, cheese, dinner rolls, fruit topped with Danish dessert, angel food cake, dirt pudding, cherry, pecan and peanut butter pies, and candy bars. Ice cream was added to the menu for the evening meal. Daughters Verena and Loretta and sons Benjamin and Joseph were all tablewaiters at the wedding (Loretta’s partner was her boyfriend Dustin). Daughter Lovina was a coffee server and son Kevin was a helper. He had to help pass the guestbook around and passed out little gifts to the guests such as pens with the bride and groom’s names and wedding date on it and also letter openers with the same on it. Daughters Elizabeth and Susan were cooks and their job was to make the many hundreds of dinner rolls fresh for the noon meal. With the girls and I being there every day, our laundry kept piling up at home. On Saturday morning we finally washed our laundry, which was bigger than normal and then headed over to see if Jacob and Emma still needed help cleaning up. They had the cleaning up pretty well finished, and Menno and Emma were opening their wedding gifts. This is usually done on the day of the wedding under a tent, but with it being so cold outside, the tent wouldn’t have worked. I almost liked it better this way, because they could take their time and enjoy opening their gifts. Menno’s family was there to watch them open the gifts. I have to admit that I was tired by Saturday, so I didn’t mind getting out of cleaning up (smile!). I want to thank my good friend Ruth for all she did to help us out over the wedding, and also for penning this column for me last week. My mind was going a thousand different directions, and I couldn’t concentrate to write. I want to wish my daughter Verena a happy 21st birthday, which was on December 10. She is a great daughter, and I don’t know what I’d do without her or any of my children. It’s just so hard to believe she’s 21! Her two nieces adore their Aunt Verena. Cream butter, sugar, salt and vanilla together. Crush walnuts until fine. Add to butter mixture. Slowly add flour to mixture until combined. Wrap dough in plastic wrap and chill several hours. After chilled, preheat oven to 325 degrees. Drop the dough by small scoops onto parchment-lined cookie sheets. Bake 10 minutes. Let cool, then roll in powdered sugar. The mercury dropped down to 30 degrees this morning! I’m sure that it frosted in most places. It makes it feel good to have heat in the house. It was good timing for us. On Tuesday we traded in our old hopper-fed coal stove for a new one. Last night my husband Joe, sons Benjamin and Joseph, and nephew Henry set up the new stove and started it. We always use charcoal to get the coal started. It makes less smoke than wood. I can smell the new paint from the new stove, so I like to open a few windows slightly to get that smell out. It’s not too bad, though, because the stove is in the basement. We have an enclosed jacket around the stove so that we can control whether we want all the heat to come upstairs or heat the basement too. The heat travels upstairs to the bedrooms through our open staircase, which is close to the big vent in the floor over the stove in the basement. The boys like to keep their bedrooms cool, so they shut their doors during the day. Once it’s really cold outside they let the heat go into their bedrooms. We still have a little coal left from last year, but Joe called and ordered our supply for the winter. I’s always a big relief to have our fuel for the winter! It gets expensive to buy coal, but I still think it’s nice that we can heat all three stories of our house with one stove. When I was growing up, the only heat we had upstairs in our bedrooms was what came up through the door. It was always chilly when we got out of bed in the morning, and we always hurried downstairs to stand by the coal or woodstove to warm up. This week has been rainy and cold, so we will hang laundry in the basement to dry. I have lines down there and with the coal stove going, it should dry. Daughter Susan wants to wash the hunting clothes first. They wash those clothes in a special soap so that deer can’t smell their scent. Those clothes we will hang outside. Son-in-law Timothy shot an eight-point buck last night with his bow. Daughter Loretta is still hunting, and son Benjamin has also gone hunting this fall. Loretta has a crossbow so it’s easier for her, with her disability, to shoot the arrow. I have never hunted in my life. I just could not see myself sitting quietly for that long! I would probably be making a mental list in my head of all the other things I could be doing. Daughter Susan and Mose are excited to be homeowners now. We will miss having them beside us, but I know they want a place to call their own. The place they bought is five-and-one-half miles from here. Timothy and Elizabeth live six-and-one-half miles from here and will be only two miles from Mose and Susan. Mose and Susan plan to move as soon as we get the house cleaned and ready for them. They will pull out the carpet and put in new floors, and some painting will be done. It’s an old farmhouse, but the place has been kept up very nice. The garage is only six years old. Tomorrow our plans are to attend a wedding in Rochester, Ind., for Melvin and Lisa. Lisa is a daughter to Joe’s cousin Leander and wife Rosina. More exciting news: Jeremiah James was born to niece Rosa and Menno on October 23. This would make the third grandchild for sister Liz and Levi. Try these pumpkin whoopie pies for Thanksgiving Day! These are very yummy when partially frozen. The family of Loretta’s special friend Dustin had a very good crop of pumpkins this year, with most of their pumpkins weighing over 100 pounds each. 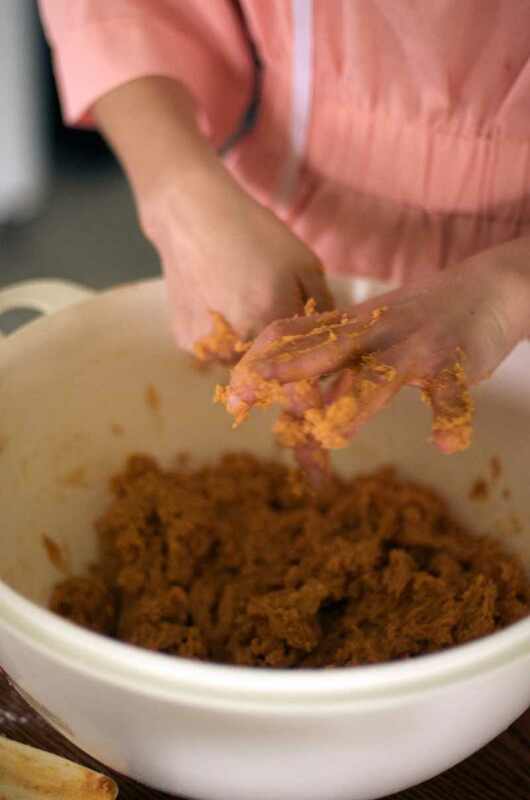 Cookies: Combine pumpkin, brown sugar, oil, eggs and vanilla in a large bowl. Add dry ingredients and mix well. Drop onto greased cookie sheet. Bake at 350 degrees until just barely done, approximately 10–12 minutes. Cool. Filling: Mix first three ingredients well and then add sugar. Spread filling between two cookies. Yields 16 whoopie pies. Spring break brings emptier nest for Eichers; plus exciting birth to announce! It has been rainy and cool all week—not the best weather for the children while they are on spring break from school! I was hoping we could get the yard raked up this week, but I’m sure we will have nicer days to work outside. There is plenty to do otherwise. The boys have been getting the barn cleaned out. Our cow Bessie decided to have her calf on the last day of March. We had the veterinarian come out and check on her the night before, as she was ten days past her due date. He thought it might be a few days yet. But the next day while Loretta was finishing up with washing the breakfast dishes, she saw that Bessie was trying to deliver out in the field. Son Benjamin was home, so he tried to get her to come up from the field to get her in the barn. 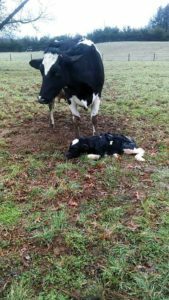 Bessie gave birth to a healthy calf this week, right out in the field. She wouldn’t move, so I called the veterinarian and he said to let her where she was and told me we should help her. Benjamin, Verena, and I tried to help her, but we needed another guy to help, so we asked our neighbor. With all three of us, we were able to help Bessie deliver a big bull calf. We were glad all was well with Bessie and the calf. Bessie is a good mother, and the calf is lively out in the field during the days when it’s not raining. The house seems empty this week without daughter Verena home. She is in Rhode Island right now, but they stopped at places of interest on the way to Rhode Island. She traveled through nine states on the way there. They slept in Pittsburgh one night and in New York City the next night. She was able to tour the Crayola Factory in Easton, Pa. I am sure she will have many stories to tell us once she’s home. We really miss her! The house seems even emptier the last few days. Daughter Lovina is at daughter Elizabeth and Timothy’s house. I am sure she’s having fun entertaining Abigail. They will come here today. I am hoping we can get some wedding clothes sewn. Verena is tablewaiter next week in niece Emma and Johnny’s wedding and needs to wear a dress of green apple color. I am a cook and will wear a dark tan dress. It will be nice to see the family again. I don’t have too many details yet, but my oldest nephew Ben (son of sister Leah and Paul) had a scare recently with his wife Rosemarie. Rosemarie had a baby girl (by C-section) named Elizabeth. A few days after she was home, Rosemarie was rushed to the hospital because a blood clot traveled to her lungs. My sister Leah took care of the newborn while Ben stayed with Rosemarie in the hospital. Rosemarie is back home and I haven’t heard how she is doing recently. We wish her a speedy and complete recovery. Our prayers are with them. On Sunday we enjoyed a haystack dinner at my sisters Verena and Susan’s. Jacob, Emma and sons Benjamin and Steven, Timothy, Elizabeth, Abigail and Loretta’s special friend Dustin were also there. Cream sugars and shortening. Add eggs and mix well. Stir in dry ingredients and blend. Divide into three parts and form into rolls. Chill in refrigerator overnight. Slice off cookie-sized pieces and bake at 400 degrees for eight minutes or until done. Pecans or walnuts can be pressed into center of dough before baking. Friday is Good Friday and we look forward to Easter on Sunday. Good Friday we traditionally keep as a holiday, so no one in our family will go to work or school. The Amish churches in this community have “Fast” (no eating) and prayer until noon. Our family will all be here and have family time. Then we’ll gather here for the noon meal. On Easter Sunday we will go to church. Easter is the time to rejoice and be thankful for the gift of life Jesus gave for someone like you and me. The younger children still enjoy coloring eggs for Easter. 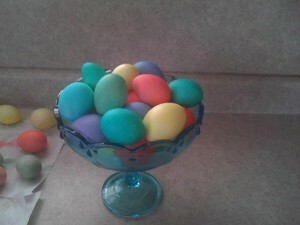 As I was growing up we always colored eggs. The bright colored eggs always remind me of the colors of the rainbow. Our parents taught us the true meaning of Easter. May we all remember the true meaning of Easter. Son Benjamin always gathered the eggs when he was a little boy around four and five. One Easter morning Jacob and Emma and family were here. My husband Joe knew Benjamin and Jacob would go gather the eggs from the hen house as soon as they were awake. 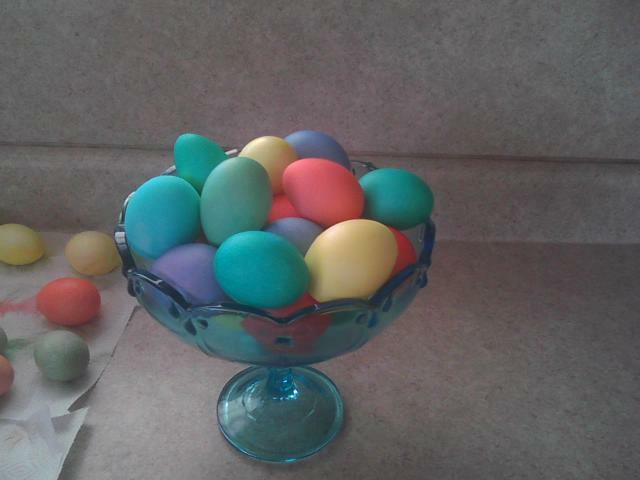 Joe took all the eggs out and replaced them with colored eggs. I still remember the excitement those two little boys had when they discovered the colored eggs. Dandelion greens are getting bigger every day. We had our first meal of dandelion salad this week, and I shared that recipe last week. This is a good way to use up the extra colored eggs since it takes hard-cooked eggs. I keep watching for the asparagus to pop through. The rhubarbs are looking good. 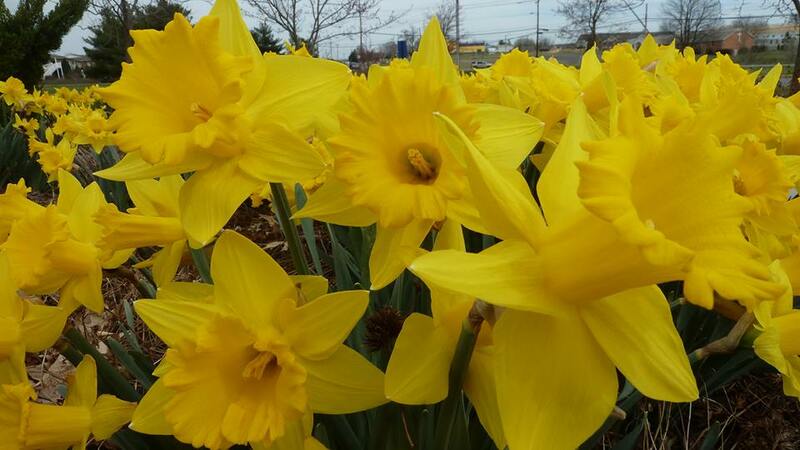 I love spring and all the signs of it. I know it brings more work but it is so nice to go out on a nice warm and sunny day and feel the gentle breeze blowing. I enjoy hanging the clothes outside again. What a wonderful creator God is! Last Friday (the week before Good Friday), sister Verena had a Tupperware party in the forenoon. She and sister Susan made lunch for all who attended. They served hash brown casserole, potato salad, jello cake, golden M&M bars, apple and strawberry slices with fruit dip, punch, and coffee. After everyone else left, sister Emma and my daughters Elizabeth, Susan, Verena, and Loretta stayed and spent the afternoon with sisters Verena and Susan. Daughter Elizabeth came here in the morning and went with us to the party. Susan biked and Elizabeth, Verena, Loretta and I took Stormy our pony and the pony buggy. The ride was a little chilly but we didn’t have far to go. Stormy was eager to run and was a little rowdy. He doesn’t get out too much in the winter months. Saturday evening Timothy and Elizabeth came for the evening and stayed here all night. Daughter Verena left them sleep in her bedroom, which was Elizabeth’s room before she was married. It seemed really good to have them here for the night. Mose (Susan’s friend) went home with Timothy to do their chores Sunday morning while the girls and I made breakfast. 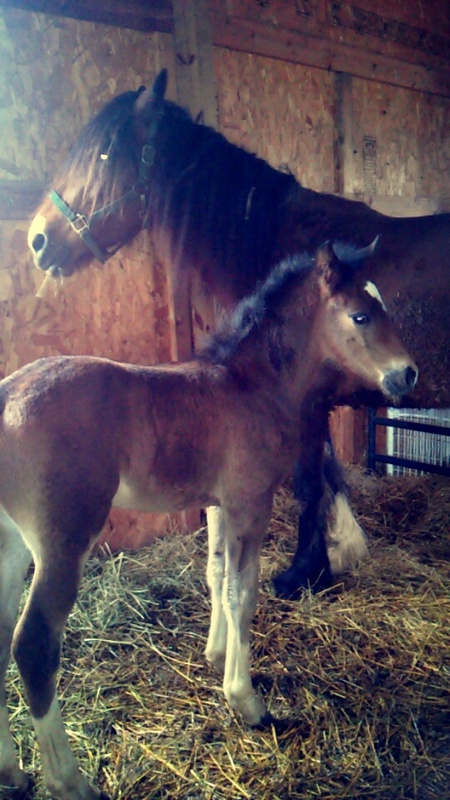 Tim and Elizabeth have a new colt, born to their horse, Shi Ann. On our menu were eggs, potatoes, bacon, cheese, toast, strawberry jam, butter, and hot peppers, with chocolate milk, orange juice and coffee for drinks. Timothy and Elizabeth stayed all day. We played games in the afternoon and enjoyed each other’s company. I’ll share the recipe for golden M&M bars. We like them! God bless and I hope you all have a blessed Good Friday and Easter. Cream together sugars and butter. Add eggs and vanilla; beat well. Stir together flour, baking powder, and salt. Stir into butter mixture. Fold in chips and M&M’s, reserving 3/4 cup M&M’s. Spread in 9 x 12 greased pan. Sprinkle reserved M&Ms on top. Bake at 350 degrees for 25 to 30 minutes. This will be my final column for 2015. After that, we enter into a brand new year. What does it have in store for us? The future is unknown, but if we trust in God to lead our way, it seems so much more encouraging. Our life brought changes in 2015, with the first of our children, Elizabeth, getting married and leaving home. It was hard to see our firstborn move out and start a life of her own. What made it easier was that we know she is happily married. Yesterday Elizabeth came home for the day to help since she and Susan are off from the factory for two weeks. 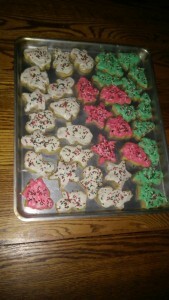 The girls made Christmas cut-out cookies. I know Christmas is now past, but we will have our annual gathering with my sisters who live in the area on New Year’s Day. The cookies were made for that day, and there is enough to snack on before. While the girls were making the cookies, I had to think of all the years that we made these cookies when they were young. I remember how they would pull up chairs to help cut out all the cookies with my Christmas cookie cutters. They liked to squeeze the dough, and it took forever to get the cookies done! This week get Lovina’s recipe for sour cream cut-out cookies. Lovina, 11, used my recipe for frosting and made it for the first time. To write one of my cookbooks, I had to measure out my ingredients for my frosting recipe. Mom had just taught us to use “a little of this” and “a little of that” and to keep adding until we had what amount we needed. But it now comes in handy to have a recipe. Loretta divided the frosting into three bowls and added green food coloring to one and red food coloring to another to make different colors. They made snowmen, Christmas trees, bells and stars. 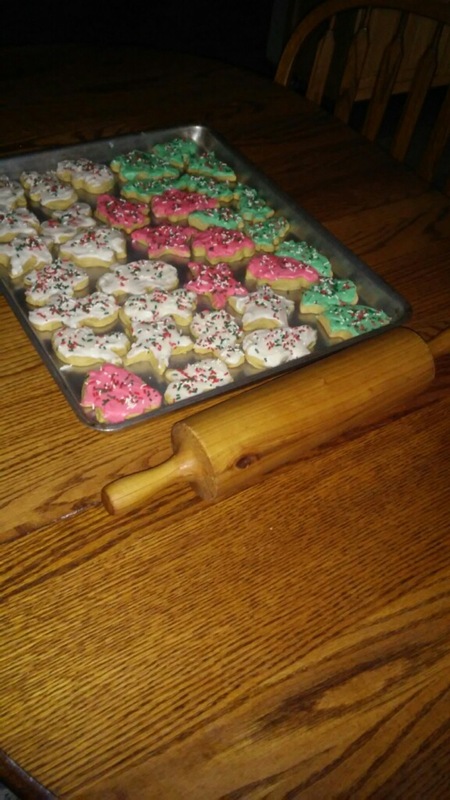 As they used the rolling pin to roll out the dough, it brought back lots of memories of my mother. This rolling pin was hers. A friend had made it for my mother; it was all one piece of wood, with the handles carved out, and it was bigger than most rolling pins. When my parents’ belongings were sold through a public auction, I tried hard to get that rolling pin. It went for too high a price, however, and I thought I would never see it again. This week Lovina tells the story of her mother’s rolling pin, pictured here. A few years went by. Then one day I received a call from my editor saying that a reader had bought Mom’s rolling pin at the auction that day and no longer needed it. The reader wondered if I would want it. Oh, I was so excited to have it back in my hands! I can’t recall the name of the reader, but if by chance you read this column, I want to thank you again! 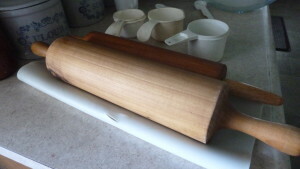 Not one time do I not think of my mother when I use this rolling pin. I still thank her for all she taught me. Most of all, I thank her for teaching me about God and to always turn to him when we need help. Rest in peace, Mother—you lived your life to the fullest and have left a legacy to us. No one else could have done any better. 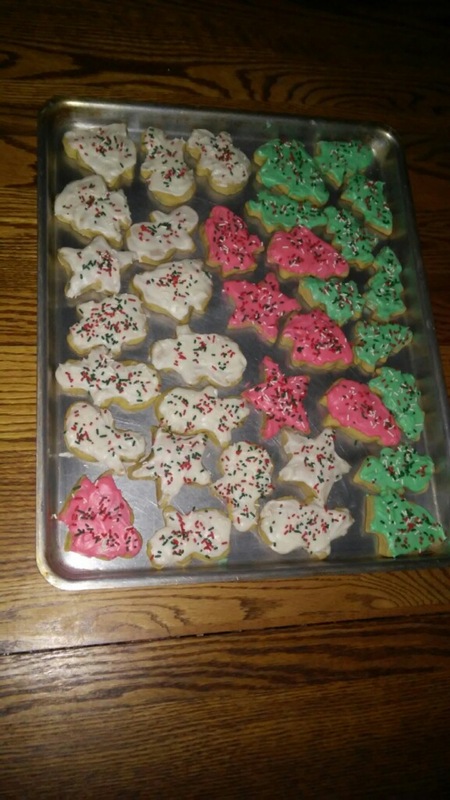 I will share the recipe we use for Christmas cut-out cookies. We love this recipe! God bless all you readers in 2016 and always! Cream the butter and sugar together in a large bowl. Stir in the eggs, sour cream and vanilla. Combine the flour, baking powder and baking soda in a medium bowl and stir with a whisk to blend. Add the dry ingredients to the wet ingredients and stir until a soft firm dough is formed. Sometimes more flour needs to be added so the dough rolls out better. Roll the dough out to a 1/2-inch thickness on a floured surface. Use your favorite shaped cookie cutters to cut out the dough. Place the shapes on the prepared pan. Bake until golden brown around the edges, about 10 minutes. Remove from the oven and let cool on the pan for 5 minutes, then transfer to wire racks to cool completely. Makes about 18 cookies, depending on shapes. To make the frosting: Cream the shortening with the vanilla and 1 cup of the powdered sugar. Gradually add the milk and the rest of the powdered sugar, beating constantly. More powdered sugar can be added for desired thickness. Food coloring can also be added. Spread the frosting on the cookies and decorate with colored sprinkles or chocolate chips. Let the frosting set before storing. One day after another goes by, bringing 2015 closer to history. We do not have snow. 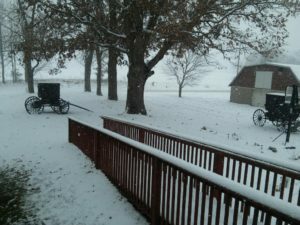 We had seven inches of snow several weeks ago, and last week a few flurries that stuck to the ground for a few hours. Our children are hoping it snows for Christmas. Snow does bring in the holiday spirit more, but we cannot forget the real reason for the season—Jesus our Savior was born! Our church will have our annual potluck Christmas dinner on December 20—our next church service. I will take a casserole, although I’m not sure what kind yet. Tomorrow is daughter Verena’s 18th birthday! I just try to grasp the fact that 18 years have passed since she was born to us. What a precious young lady she has become. I still remember well the day she was born. She was a petite, dark-haired baby. Always little but mighty! At six months old, she was crawling all over the house. She is still petite. With Kevin, 10, growing taller and taller, it won’t be long before he will pass Verena in height. My wish for Verena is to have a very happy birthday and God’s guidance through her teenage years and always. Verena will never leave or go to bed without giving me a hug and a kiss. What a joy to be her mother! Along with joy, life also brings us sorrow. Our hearts are still in shock from hearing the news of cousin Larry Coblentz’s death. It is with regret that we were unable to attend the visitation or funeral. The funeral was yesterday with visitation only an hour before the funeral. Several of our children had appointments that were unable to be changed. Our hearts and prayers were with the family as they laid to rest a kind-hearted son, father, brother, uncle and grandpa. Larry was one of my favorite cousins. He always had time to visit even though we didn’t get to see each other as often in the recent years. Larry was a big supporter of my column and a great encouragement to me to keep writing when it would have been easier to just quit. There was more than once at a book signing that I would spot Larry’s face in the crowd. How comforting to know he drove several hours to be there. Larry was the oldest of my cousins on the Coblentz side. His dad, Albert Jr., was my dad’s oldest sibling and will be 86 in January. Our sympathy goes to Uncle Albert Jr. and Aunt Shirley and also to Larry’s son, David, and children and his extended family. Rest in peace, Larry! Your life touched many! Son Joseph, 13, was very excited to shoot his first deer last Saturday. He went hunting with Mose (daughter Susan’s special friend). But after he had shot the doe and they had tracked it, Joseph was disappointed to find that someone else was taking it! It was not worth an argument, and I told Joseph maybe the other hunter needed the meat more than we did. It is hard for a 13-year-old to understand that God wants us to forgive someone before the person even asks to be forgiven. 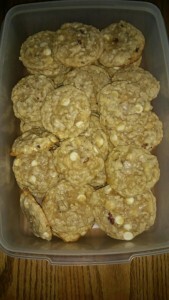 Daughter Verena made pecan-white chocolate chip cookies for the Eicher family this week. 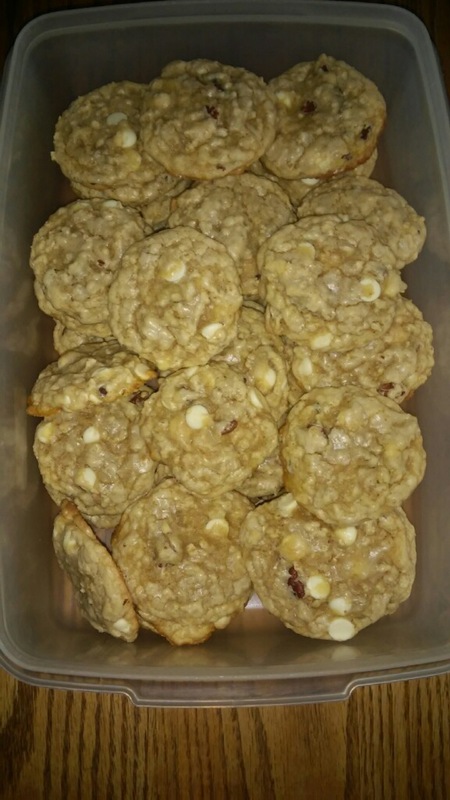 This week I will share the recipe for pecan–white chocolate chip cookies. Daughter Verena baked these last week. Preheat oven to 375°F. In a bowl, mix together butter and brown and white sugars until light and fluffy. Beat in eggs and vanilla. Stir in oatmeal. Sift together flour, baking powder and baking soda and add to rest of ingredients. Stir until combined. 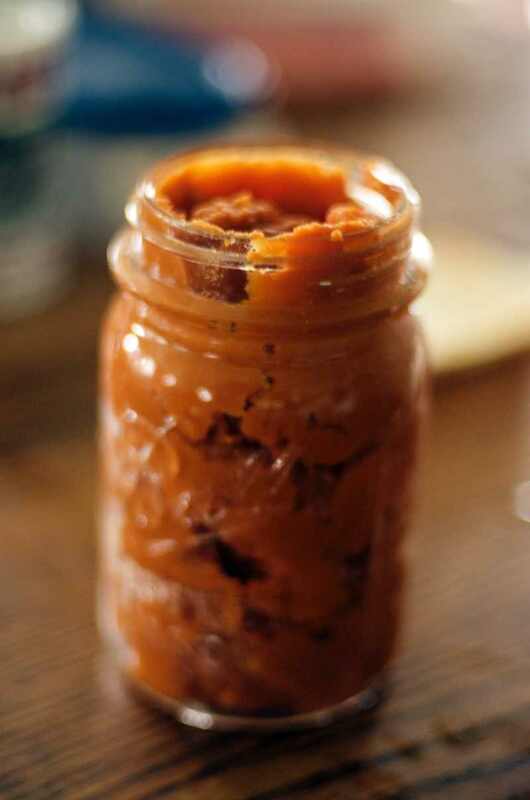 Add pecans and chocolate chips. Bake for 10-12 minutes. Note: for a soft, chewy cookie, bake only 9-10 minutes. A longer bake time will make a crisper cookie. Joe will have his forty-sixth birthday on Monday, Dec. 22. I want to have a birthday supper in his honor but am undecided yet which night to have it. 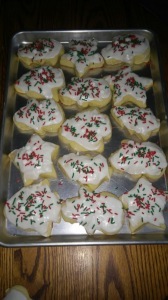 This week I will share with you the recipe for sour cream cut-out cookies. We like this recipe to make Christmas cookies. 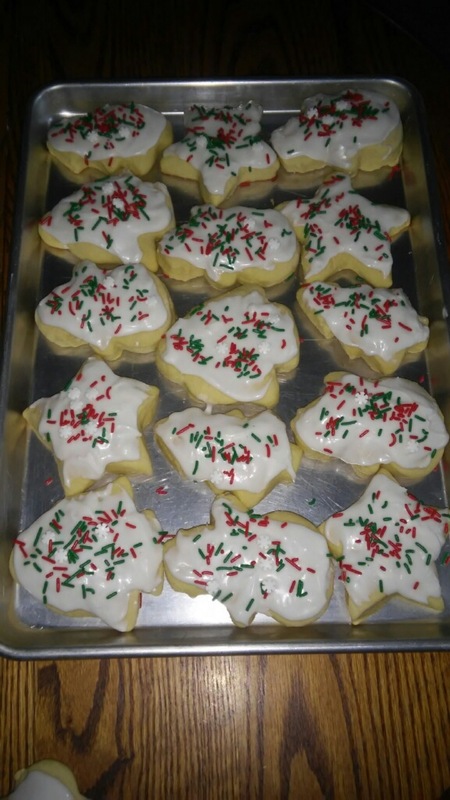 Making sour cream cut-out cookies takes time—to mix up the dough, roll them out, cut out and bake—but the Eicher family comes back to this recipe year after year.